Since I have been visiting my family we have made cookies every night! Gasp, No! Say it ain’t so! Well folks, it is and since I have yet to work out since I have arrived I may be headed back to SF with a little more meat on my bones! Last night, we made Cranberry Hootycreek cookies. My grandma had the recipe stashed in her recipe box and it did not disappoint. 1. 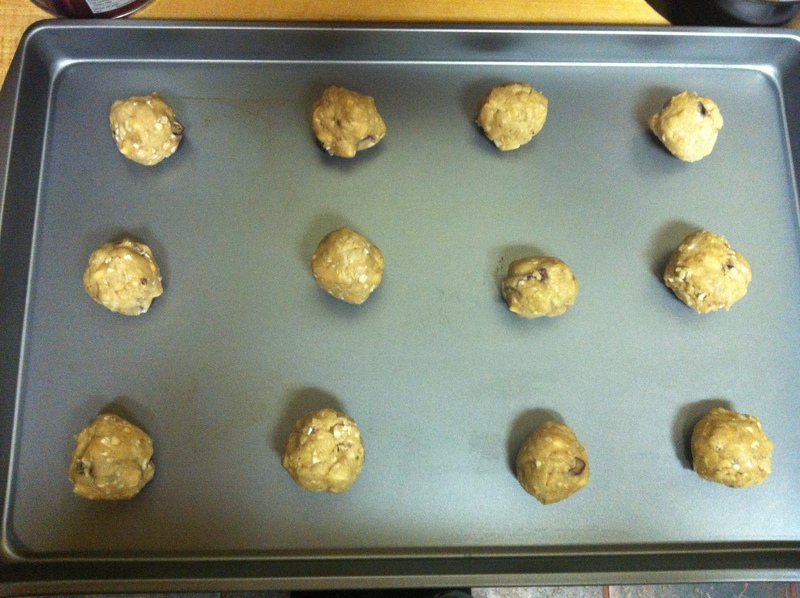 Set aside a non-stick cookie sheet or line a cookie sheet with parchment paper. 2. 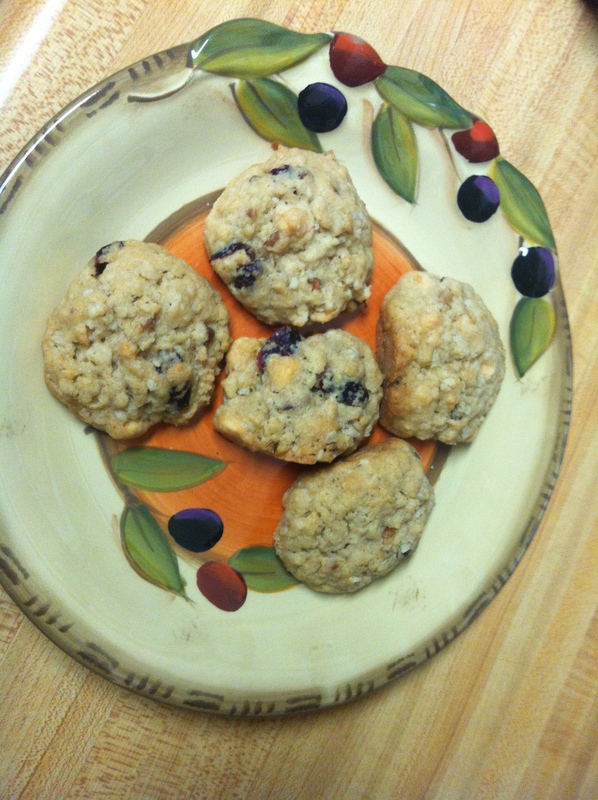 Combine flour, baking soda, and salt – add oats. 3. Next, use an electric mixer to cream the butter for 1 minute. Add white and brown sugar and vanilla until light and fluffy. ( We used Medium Speed on my Grandma’s 50 year old mixer.) 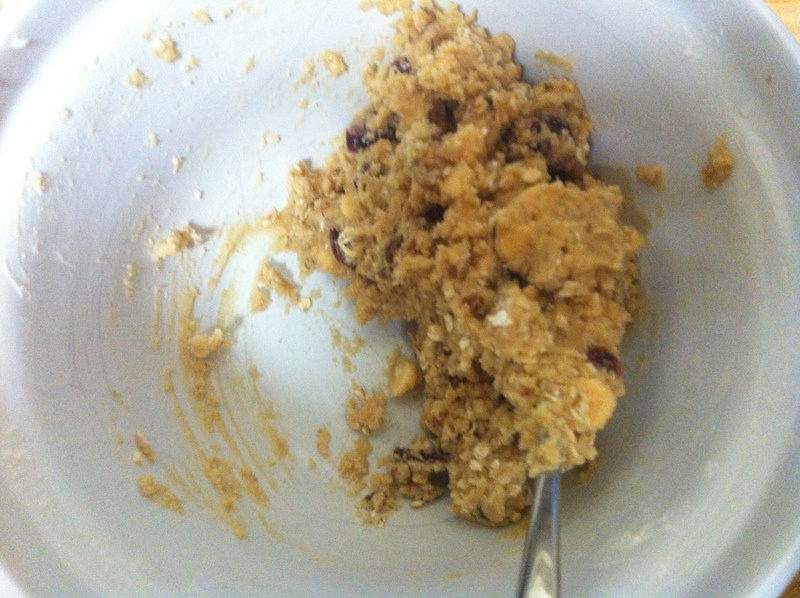 While beater is running, add eggs, one at a time, and beat 2-3 minutes or until mixture is smooth. 4. Add dry ingredients slowly until well combine. On low speed. 5. Mix in cranberries, chips and nuts by hand. 6. Drop batter in tablespoonfuls onto prepared baking sheets. 7. Cook for about 7 to 12 minutes. The goal is to have the edges slightly browned. 8. Remove from oven- and set on wire rack. Or just remove, my family literally grabbed them off the baking sheet! Recipe makes about 30 to 50 cookies. Sounds like a lot but don’t worry – they were gone in a jiffy. They make a great dessert, snack or breakfast. My dad even crumbled a couple in his greek yogurt! By the time I got around to taking the picture almost all the cookies were gone! Previous postThe Sooner its not iceee the better!